RUSSELL to be on travel to Australia, so a few schedule adjustments ahead! – Ce Soir Arts – Be inspired tonight! RUSSELL to be on travel to Australia, so a few schedule adjustments ahead! Yes, you read that right! Russell is indeed soon off to Melbourne to visit our dear friend Kadoodle. She is doing well following surgery at Peter MacCallum Cancer Centre at Melbourne; she is at home now and recovering. Along with several other venues, we at Ce Soir Arts held a special event with Russell in order to raise funds to the Centre this past month, in cooperation with the Centre‘s 2014 Ride to Conquer Cancer. We are so pleased to have been part of that and we are sure that having Russell in for a nice visit will enhance Kadoodle‘s home care and recovery, and we could not be happier to collaborate with Russell in these needed adjustments to the schedule. So…the schedule will change for both his weekly readings at The Magic Tree Reading Spot in Ce Soir AND his weekly musical shows, for the time being. Don’t worry! We’ll be sure to keep you apprised of any additional changes, but we believe the following schedule will remain constant throughout Russell‘s travels, beginning with the musical show on Thursday, 25th September. Click event titles to teleport. Russell Eponym, Poet Laureate of Ce Soir Arts, will join us for an hour of reading, rumination, and song that will delight and educate. His extensive knowledge, kindly spirit, and lively wit and wisdom make every hour an unforgettable experience. Reading from an eclectic mix of some of the best poets and writers of all time, Russell keeps us in rapt attention. Sharing his own original writing, he brings us insight and enlightenment, as his Thought for the Day opens us to new ideas and dreams. 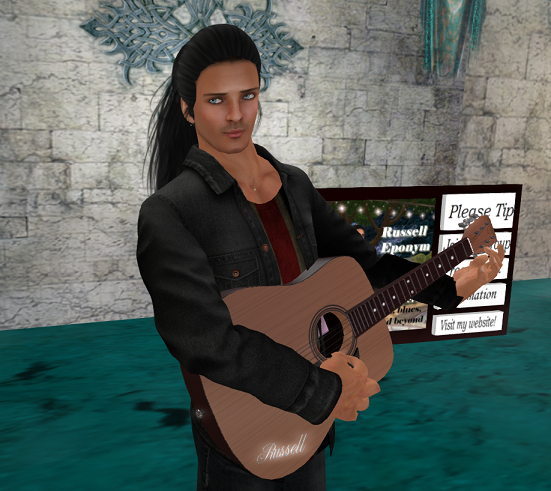 Russell generally opens with a beautiful selection of music from across the artistic horizon and then brings out the guitar for an original song or two as well. It is magical! RUSSELL brings 90 minutes of exceptionally enjoyable music, a growing collection of historical folk tales set to music and his own lovely compositions. Lyrically beautiful and musically rich, the Russell Eponym sound invites the listener in. Sweet melodies and toe-tapping tunes showcase his unique finger-picking guitar style, his velvety voice, and his talents with the harmonica, banjo and even the kazoo! From dreamy love ballads to songs that will tickle your funnybone, Russell has them all. Add the delightful Eponymous family of friends who gather to enjoy his music, and you are in for a charming hour! Previous This just in…NEAL HOFFMANN & SAINTESS LARNIA to Celebrate the Art of SECRET RAGE this Saturday at Ce Soir Arts!!!! Next Everyone’s got the travel bug! MoShang off to Rome to share his new wonderment: the Groovesizer!